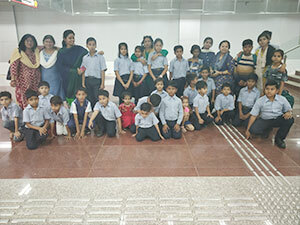 Primary students were taken on field trip on 9th of April 2019. There were around 30 students accompanied by 7 teachers to the Metro Station. Journey began from Munshipullia Metro Station and ended at Sachivalaya Metro Station. Students observed many things through this trip. 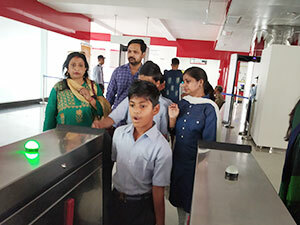 They saw many computerised machines, automatic entrance doors, vending machine and maps showing various stations covered by the Metro. Trip was very informative for all the students. They were made aware of the whole system by the Metro Station’s Officer In-charge. It was joyful trip as well as an informative activity. 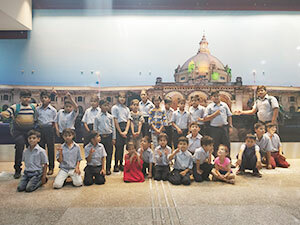 The excited group of SRMPS primary students went for an educational trip to the historical and famous monuments of Lucknow. 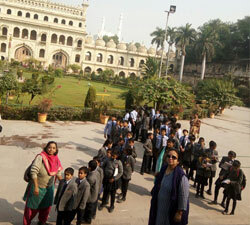 The children had a trip to old Lucknow where they visited bara Imambara and Shaheed Smarak Park. 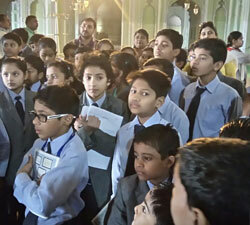 The children were awestruck to see the great architecture of the Nawabs. They saw the beautiful Imambara of the Nawab Asaf-ud-Daula and the architecture of Kiyafatullah. The pitch darkness of Bhool Bhulaiya was the scary adventure for the children as the group of frightened voices matched the pitch- darkness. After Bara Imambara they went to Chota Imambara after a little glance of Rumi Darwaza. The Chota Imambara was a perfect beauty with the reflecting pond was the icing on the cake. A couple of beautiful Mosques added glamour to the beautiful building. They saw some beautiful ‘Taziyas’ . The Quran was encrypted on the walls of the Imambara. At last they visited the Saheed Smarak Park. On the way back they saw the Begum Hazrat Mahal Park, Isabella Thorbon College, Colvin Inter College and The Lucknow University. 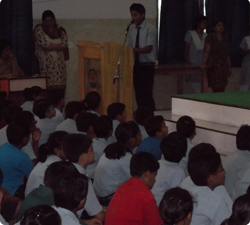 It was an energetic and enthusiastic day for the students of the SRMPS. 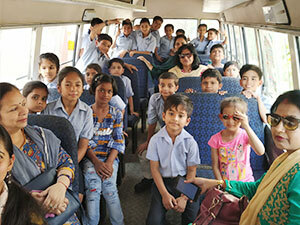 A school trip was organized for the students of Shri Ramswaroop Memorial Public School , with a total of 171 students . 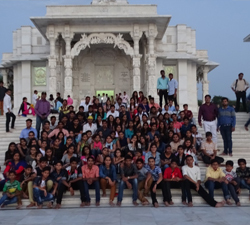 The Boys and girls together had a gala time in the Royal state of Rajasthan . The beauty of Jaipur, Pushkar and Ajmer is awestruck and its journey is indeed a breathtaking experience . The journey started on 9th of October 2016 and continued till the morning of 17th October 2016 . The six days tour has surely become an indelible memory for each heart , the recollection of which will remain a part for rest of their lives . The students checked in to the Holiday resort, every bit of which showcased the traditions of the state . 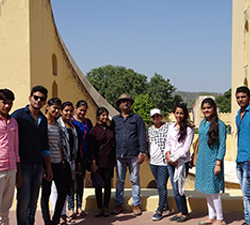 Jaipur welcomed the group with open arms where they were mesmerized by the beauty of Albert Muesum , Birla temple , City Palace and Hawa Mahal . Thereafter they offered prayers in two of the famous places- the mosque in Ajmer and the oldest Bramha temple in Pushkar . Raj Mandir very easily took away three hours as they saw M.S.Dhoni the untold story there . As all good things reach to an end, so did this trip. The students had fun doing Rain Dance , Water rides , Camel Safari and many more rides . It is said, “all’s well that ends well” . This surely stands true as the trip ended with cool shopping . 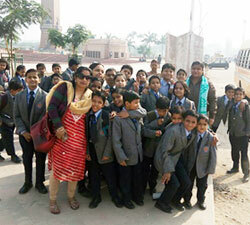 Thereafter all the three buses departed for Lucknow bringing an end a fabulous and enriching tour . 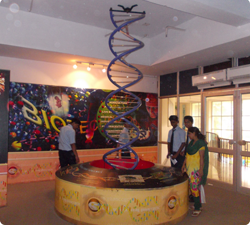 Shri Ramswaroop Memorial Public School students of class IX went to the Regional Science Centre, Lucknow on August 07, 2014. It was the inauguration ceremony of the documentary on Antarctica. Vice Chancellor of Lucknow University, Prof. S. B. Nimse was the chief guest of the function. 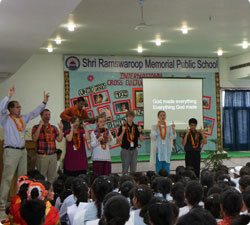 Students of SRMPS were privileged to participate in this ceremony. They felt the shivering temperature of minus 128.56 degrees Fahrenheit (minus 89.2 degrees Celsius) without being physically present in Antarctica. And the documentary was presented on an oval shaped screen in the SciMax theatre of Science Center. 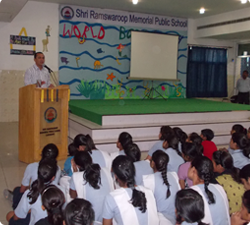 An exclusive International Cross Cultural Program was held in Shri Ramswaroop Memorial Public School on July 4, 2014. 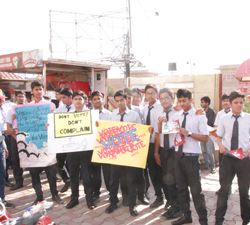 The program was held in collaboration with “Compassion India” – unit of an NGO – Zion Sewa, based in Lucknow. The delegates, 22 people from US, Japan, South Africa, Zambia, Philippines and India, who are now based in Dubai, ranged from 7years to 48 years. They were greeted traditionally with kumkum on their forehead and sprinkling of rice grains. Ab-initio, a lamp was lit to invoke the blessings of God. It was then followed by Ganesh Vandana. The program began with an introductory speech by Mr. Raj Shekhar, the leader of Zion Sewa, Lucknow. He gave a brief description about his NGO. Thereafter two videos one depicting Indian culture and heritage, and another modern India was shown to the guests so that they could have a glimpse into the past and culture of India. Thereafter one member from each country gave a description about their homeland that included the geographical location, flag and the places to visit in their country. 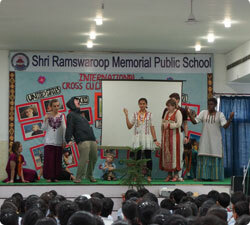 Several songs and plays was presented by them depicting their cultural heritage. 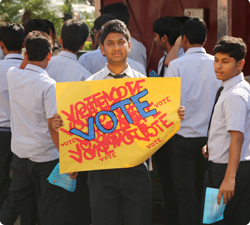 At the end there was an interaction between the delegates and the students of our School. They had many interesting questions related to the countries the guests came from. The motto behind organizing this program was to develop cross cultural learning amongst the students and to ensure that they can adapt and fit into a culturally diverse global culture .Every one welcomed the opportunity to learn more about the geography and culture of other countries. The program was concluded by a vote of thanks by honorable Principal Mrs. Poonam Kochitty. 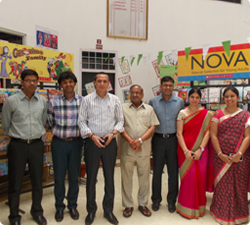 The guests were overwhelmed with the hospitality of our school. Mornings come with new hopes and Tuesday morning of SRMPS was not an exception. On the gracious presence of young & dynamic D.M. 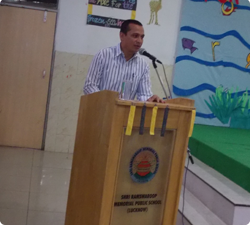 of the city, Mr. Raj Shekhar, infused the new zeal and enthusiasm among the children of SRMPS on 13.5.14. He counselled and motivated the children to serve the nation by entering into the most prestigious and noble profession of Indian Administrative Services. He shared his journey of hardships and success with the children. He briefed the students about the selection procedure and criteria in Indian Administrative Services. He urged the students to dream big. Our DM concluded the discussion with the inspiring words “There is no shortcut to success and nothing can replace the hard work”. He urged the students to dream big. 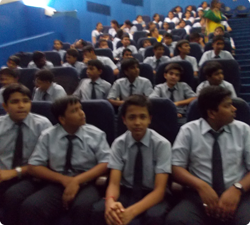 International Children Film Festival in C.M.S. Fri,2 May 2014 at 9:45 a.m we moved from the campus to CMS LDA branch to witness the 6th International Children Film Festival. The Chief guest Mr. Shashi Vyas, Dr. V. Kurien were present there.We enjoyed the movie 'Bharat Bhagya Vidhata' directed by Mr. Sashi Vyas. The Movie was based on the theme 'Where India lies'. Teenagers feel that India exists only in the cities but after watching the movie we realized that the real India lies only in the villages. The second movie was an animation named 'Gopi Gavaiya and Bagha bajaiya' . This movie is based upon the moral that 'happiness does not lie in war but living together in peace. 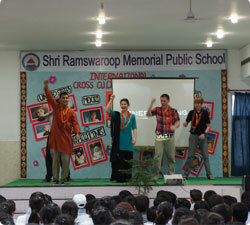 At 3:00 p.m we returned back to the school campus>we also met with Taptesh and Khushi who are renowned child actors. Students of classes –XI to XII had an exposure on April 26, 2013 to National Botanical Research Institute as apart of education visit .The length and breadth of NBRI ,was adorned with all variety of plants ,some plants as small as insect to some plants dating back to the 19th century .NBRI was divided into several section, each section dealing with particular variety of plants .we scrutinized the leaves of plants some with peculiar shape which are rarely seen . Plants were divided into rare. endangered endemic etc. The cactus house had a plethora of cactus, not less than 30 types of cactus, and some ranging up to 10 meters tall. Bonsai house drew a lot of interest/------ since the trees which all very giant were converted into small plants planted in pots . Plants displays here dated back to 1930. One of the Peepal tree was just 1 meter tall. Other sections included palm house, moss house etc. we had a lot of frolic in the moss house since water was sprayed on us from the top . It was a way to water moss plants. It came as a cool reprieve on chat suttery afternoon. Being surrounded by the emerald like trees made us feel as if we were in another world.The evening had its own charm. Student had a chance to talk to one of the most eminent scientists of India, Pro f, Y.K Rajan. who is Padma Shree Awardee too. He explored our mind and threw light on India’s future and our contribution .he discussed about some fragmatic approach. he developed an extra science acumen in us. After his steering talk , student shot a volley of question to him which made the session even more interactive and engrossing. It was a pleasure listen this marvelous scientist and a great experienced to meet this stalwart who developed a scientific acumen and inquisitiveness in us. This experience will be cherished by us throughout our lifetime.